Michael Irving and Matt Wain. Skegness Tri Club’s Michael Irving and Matt Wain travelled to France to compete in a 70.3-mile Ironman race. Athletes started the day with a 1.2-mile swim in Vichy’s beautiful Lake Allier. The fast 56-mile bike course is on country roads and heads through the regions of Allier and Puy-de-dome, with exceptional views of the Chaine des Volcans d’Auvergne. The race ends with a 13.1-mile run on the shores of Lac d’Allier in historical Vichy. There hundreds of spectators lined the course to cheer the athletes across the finish line. Hot weather with temperatures hitting 30C made the run tough going, but both finished this very challenging triathlon distance race. Matt finished in 5:43.05 and Michael in 6:06.27. Fellow club members travelled to Nottingham to take part in the Zoot-sponsored team relays, organised by OSB events. These races are in a format most club members hadn’t experienced before. Teams of four had to, in turn, swim 500m in the National Water Sports lake. This was followed by a 15km bike on the surrounding lake path and run one 5km lap around the lake. The event was exciting and adrenaline-fuelled with speed and slick hand overs being the essence. One of the teams comprising of members Alan Wheeler, Pete Nicholls, Ryan Johnson and Ash Epton came in 16th position out of 200 teams who entered. 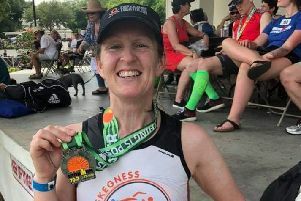 Suzy Wain competed in her first open-water triathlon.